Italy in spring... simply gorgeous! Italy in spring? Stunning! But while that’s true no matter where you are (in fact, here are 6 reasons we love Italy in springtime), we tend to think that nothing shouts spring!… more than blooming flowers. And gorgeous views. And verdant landscapes. Especially in a country as full of natural beauty as this one. You agree? Then make sure you check out our list of places you especially won’t want to miss in Italy in springtime. Here are 6 of our favorites. The Dolomites are great for skiing in winter, and hiking in summer… but when it comes to the combination of vibrant greenery, beautiful flowers, and just a trace of snow on the mountains, we love the spring! 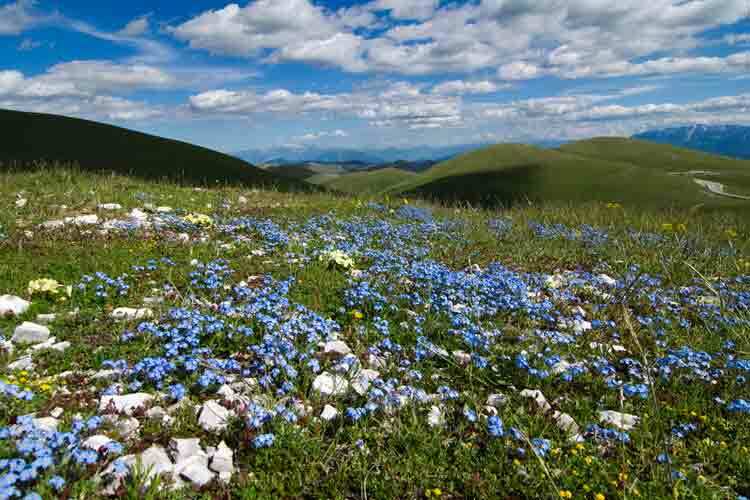 Above, wildflowers grow in the Brenta Pass, a popular place for hikers. Sure, all of the Amalfi coast is pretty beautiful in spring. The terraced hills are bright-green and spotted with flowers, the temperature’s balmy… and yet, because it’s not high high season, towns like Amalfi and Positano aren’t yet shoulder-to-shoulder with tourists. That said, Ravello is our favorite springtime spot on the Amalfi coast. Why? Its villas… and their gardens. 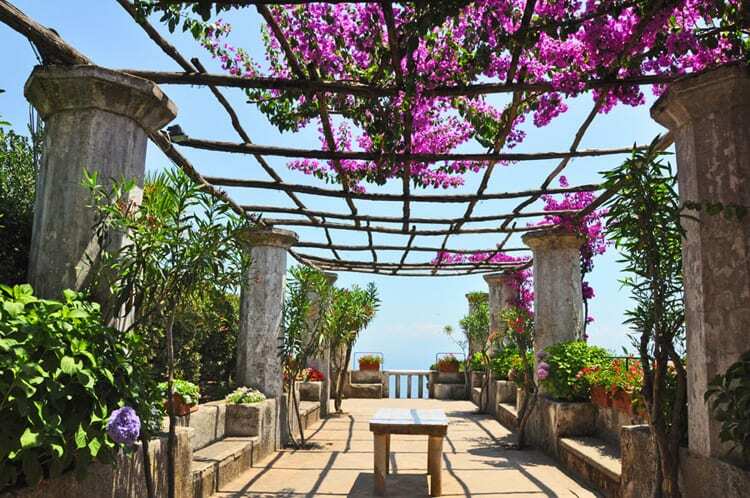 The 13th-century Villa Rufolo has enchanting, flower-filled gardens and views of the seaside. Oh, and so does the Villa Cimbrone. And just exploring the tiny town, you’ll probably find other villas and vistas that couldn’t make you happier to be in Italy in springtime. The countryside of Umbria, the region next to Tuscany that’s often dubbed the “green heart of Italy,” is beautiful year-round. But in the springtime, when the weather is balmy (but not too hot) and, yes, the flowers are blooming, it’s particularly pretty. 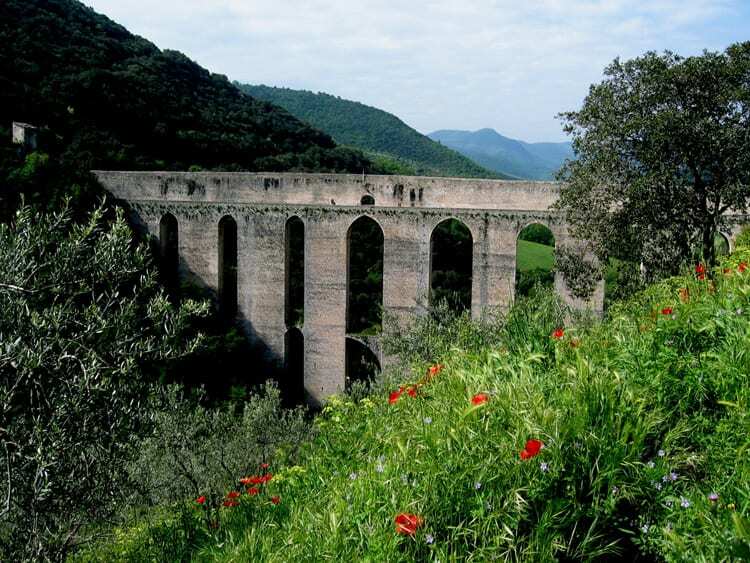 Seek out a medieval hilltop town like Spoleto, shown above, to get gorgeous views of the rolling, verdant countryside. Although people often pass it by for Tuscany or Umbria, the countryside of Abruzzo is stunning. One of our favorite spots is Campo Imperatore, an alpine meadow not far from L’Aquila, which happens to be the largest plateau in the Apennine Mountains. In the springtime, shepherds emerge from neighboring hill towns to graze sheep, cattle, and horses here. Wildflowers are everywhere, like those above. And for real flower enthusiasts, there’s the Alpine Botanical Garden, which includes about 300 species of plants and flowers indigenous to the mountains region. Is there a reason to visit the Val d’Orcia, the picture-perfect area of Tuscany that’s even a World Heritage site , any time of year? Absolutely. But one of our favorite times has to be the spring—if for no other reason than the way the grasses turn electric green this time of year. Oh, and the baby animals at the farms are nice to see, too. 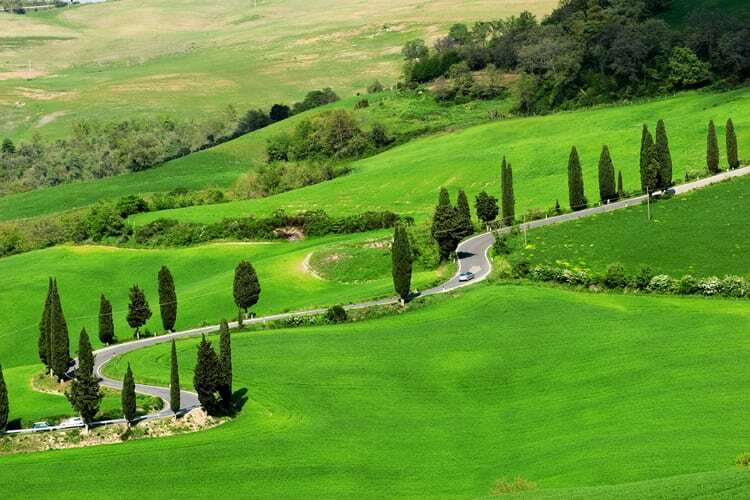 (You can explore the Val d’Orcia with us on our day-long Tuscany excursion). The lakes of northern Italy are a perfect destination in April or May. As with the Amalfi coast, the weather’s much better than it would be over the winter, and the restaurants and hotels are open—but the real crowds haven’t yet arrived. Better yet? 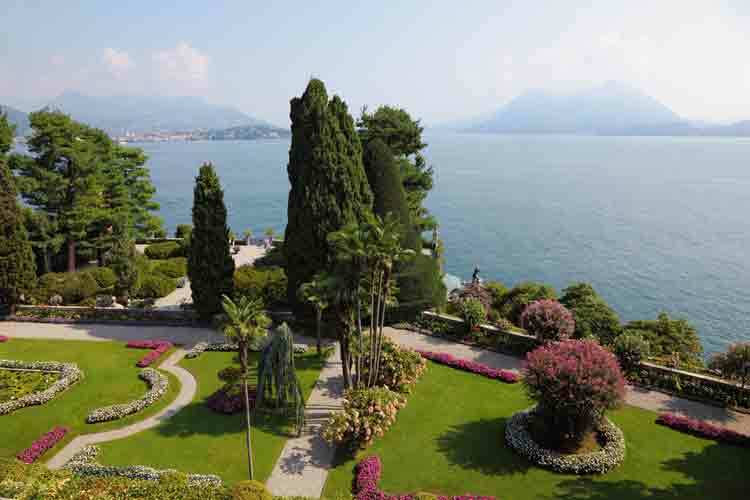 The lakes are famous for their opulent villas… and villa gardens. And if there’s anything prettier than a beautiful, flower-filled landscape, it’s a beautiful, flower-filled landscape that’s perched on a sparkling-blue lake. (Don’t miss our post on how to choose between Lake Como or Lake Garda!). Want to fit in with the Italians during your visit? Check out our post on how to dress like an Italian, in the spring! Previous articleOur Holiday Gift for You: A Discount on All Walks Services! Wonderful suggestions and photos! Will be sure to share with our readers at Italia Living. …but let’s not forget about Turin and Piedmont!! You have mountains, lakes and hills, tons of things to do, visit and taste!! Pingback: Sabay News Online » Blog Archive » រដូវ​ផ្កា​រីក​នៅ​ Italy ពិត​ជា​អស្ចារ្យ​!! Wow! I love it! Is the second picture for real? I hope the place is as good as those in the pictures or beyond that. Do you have any suggestions of cities in Tuscany and Umbria that are more easily accessible without having to walk up a lot of steep cobblestone streets? I’m traveling with my mom who is older. She gets around fine, but is unsteady when it’s hilly or the poor footing of cobblestones. We are renting a car, so places where I can either drop her near the hotel and main tourist sights or it’s at least not too difficult a walk from the public parking areas. Or places where you can get a taxi into the center of town from the parking. Thank you for any advice!! We’re happy to help! These medieval hilltop towns can be a little tough, so here are some spots we’d recommend. In Umbria, flatter places include Norcia, Castiglione del Lago, Bevagna, Foligno, and the base of Assisi (not where the historic center of the town is, but Santa Maria degli Angeli). Perugia also is well-equipped with escalators that bring you up into the city, and from there it’s fairly flat. In Tuscany, flatter options include Pisa, Lucca, Florence, Pistoia, Gaiole in Chianti, Grosseto, and Livorno. We hope that helps, and that you and your mother have a lovely time! Nice descriptions and Amazing photos. Very good suggestions…and beautiful pictures! Hi! Thanks for such a wonderfuk website with a wealth of information! My husband and I are planning a trip to Italy in the second half of April, for 10 nights, flying in and out of Rome. Ive booked my first 4 nights in Rome but am a bit confused as to what the rest of the trip should look like. I would like to see Florence and Venice, probably for 2 nights each. In addition I was thinking of Naples and maybe a day trip to the amalfi coast, but im not certain if this is a good idea ie will we be spending too much time travelling e.g trains, buses etc; and if we do go ahead, what would u suggest – naples after rome, or florence, venice and then back down to naples and then a closer ride back to rome for our flight out? Or should we just focus on the North and perhaps see a smaller town like Siena or Bologna? Any help would be appreciated! As always, we suggest to not try to pack too much into your trip. If you do add other cities onto your trip, we suggest to keep them in the same general area. So Florence and Venice, both in the north, makes more sense than Naples and Florence, though the two aren’t necessarily near. We do have many day trips from Florence, as well as an Amalfi Coast day trip from Rome with a Pompeii tour led by an expert local guide that might help you get the most out of your trip and at the same time, not overbook it! Hello – Wonderful post! We’ll be in Italy in mid-April; is that too early for hiking and wildflowers in the Dolomites? 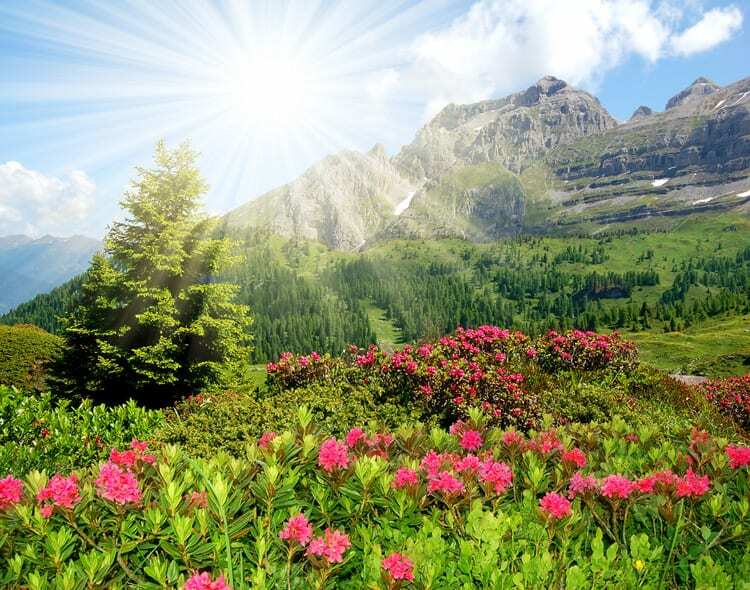 If so, where would you suggest would be best for gardens, hiking, flowers? We’re spending a week in Rome and Florence, and then want to have a week of countryside, gardens, walking, etc. where we stay in one place and do day trips. Thank you! Of course springtime is variable and it depends on the year, but on average the Dolomites are in the 70s(F) and the wildflowers should be in full bloom! Obviously the higher you go the cooler it will be while hiking, but we’re confident you’ll be able to find some greenery and mountain sunshine while there! Have a great time!